Please raise your hand if you enjoy something sweet and delicious every so often, or more! Both of my hands are up and waving around. I admit it, there are days that I crave a treat, but typically try to find something else to satisfy this feeling. Recently, I was asked by My Blog Spark to review the new Yoplait Delights Parfait. Since I had seen them advertised and was intrigued, I signed up. I was sent a gift package (giveaway for readers below) and a coupon for a free package of my choice. The boys and I eat a lot of yogurt. Our refrigerator is always stocked with them as healthy snack alternatives. The first Delights that we tried was the Lemon Torte and none of us believed that we were eating yogurt. The texture was smooth, creamy and the top just melted in our mouths. It seriously tasted like a bakery treat on a spoon. Next up, we tried the Triple Berry Creme. My oldest son, NHL really loved this one. He actually asked to take one in his lunch box because it tasted so good. Of course, I obliged and TechyDad also took one to work. Last night, I finally tried the Creme Caramel. I was looking forward to this one the most. I love caramel and thought this sounded the best. It was good, but not my favorite. There was a caramel flavor, but without the gooey caramel thing going for it, it just was not quite the same. I know that once we can find the Chocolate Raspberry flavor we will also taste test that one. We will definitely be purchasing more of the Yoplait Delights Parfait packages because they are a nice. The bonus is they are only 100 calories, taste great and do not break the budget. You can purchase your own Yoplait Delights in your grocer’s dairy section and be sure to print out a $1.25 off coupon before you go. Nutritional information for each of the flavors can be found on the website here. One lucky winner will receive their own "Delight Your Day" gift pack that includes a spa mask, wrap robe and slippers along with a coupon to pick out your own Yoplait Delights to try. MAIN RULE – Answer the following question: What snacks do you find most delightful during the day? 1 Bonus Entry – Which flavor of Yoplait Delights are you most interested in trying? To enter, please follow the rules above within the comment section. Contest starts today October 1st and ends at 10:59 EST on October 9, 2009. You do not have to be a blogger to enter, but must leave a valid e-mail address for me to contact you for mailing address once the giveaway is over. I will select the winner using random.org and contact you via e-mail. You will have 48 hours to claim the prize. If there is no response, another winner will be selected. Open to U.S. residents only because the coupons are not valid outside of the United States. Disclosure: This review and giveaway was made possible by My Blog Spark. They provided me with the gift pack and coupon to purchase a package of Yoplait Delights. The opinions of this review were mine and I received no other compensation. I find cereal, yogurt, and chocolate delightful treats to snack on during the day. I am most interested in trying the lemon. I choose Pepsi and Doritos to snack on and yes thats unhealthy but I crave it! I love gala apples and that caramel dip! .-= Heidi V.´s last blog ..Babywearing for Parents and Kids + Target GC Giveaway – Ends – 10-24-2009 =-. I enjoy heart healthy almonds and I love the Chocolate Raspberry Yoplait Delights, Yummy! 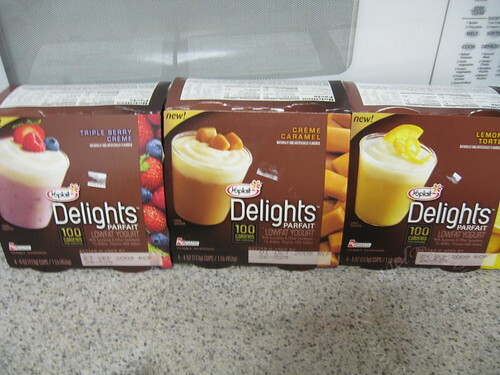 I enjoy anthing sweet but also trying new yummy yogurts that sound like dessert! I love cookies, chips, fruit and yogret. I enjoy yogurt, an apple, nuts or pretzels during the day! .-= Carolyn G´s last blog ..WINNERS!!! Success Rice Review and Giveaway! =-. Chocolate is the most delightful snack during the day! I’d like to try Chocolate Raspberry ! Thanks to everyone that entered the giveaway. Entries are now closed and a winner will be notified soon.